Courteney Cox sits down for an interview on Busy Tonight on Thursday (March 21) in Los Angeles. The 54-year-old actress reunited with her former Cougar Town co-star Busy Philipps for the interview and they reminisced about their time on the show. Courteney talked about joining Instagram and Busy brought up the Friends throwback that she posted the night before. If you missed it, Courteney shared a video of herself standing outside of Monica’s apartment building in New York City. “So last night I posted that. I was at Jennifer [Aniston]‘s house and she’s like, ‘Post that now then, let’s see what happens.’ Because she’s not on Instagram yet either,” she said. Courteney Cox starred as Monica Geller on the hit NBC show Friends for years, and now she’s made a triumphant return to the iconic New York City apartment location that was shown in each of the show’s 10 seasons. The actress posted the video to her Instagram page – and if you don’t know, Courteney just joined Instagram a few weeks ago! ALSO READ: 20 Celebrities You Didn’t Realize Guest-Starred on ‘Friends’! Courteney Cox is giving Friends fans the best context ever! The 54-year-old actress took to Instagram on Friday night (March 1) to share a video of fiance Johnny McDaid and a few friends moving a piece of furniture. “Pivot! PIVOT!” Courteney yells while filming the move. 20 Celebrities You Didn't Realize Guest-Starred on 'Friends'! 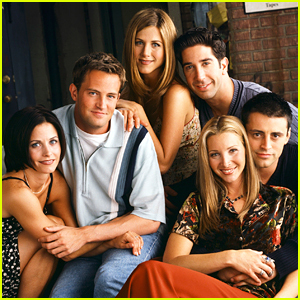 Friends may have launched the careers of Jennifer Aniston, Courteney Cox, Lisa Kudrow, Matt LeBlanc, Matthew Perry, and David Schwimmer – but it also featured a lot of other celebrities! Several big name stars from Paul Rudd to Bruce Willis to Cole Sprouse all had recurring roles on the shows – but tons of other stars had one of the first big TV breaks on the hit show. And now that Friends will be staying on Netflix through 2019, you have the chance to go back and re-watch all 10 seasons to catch all of the celeb cameos! Courteney Cox Surprises 'Friends' Superfan on Her Birthday - Watch Now! Courteney Cox gave a fan one of the best birthday surprises ever! 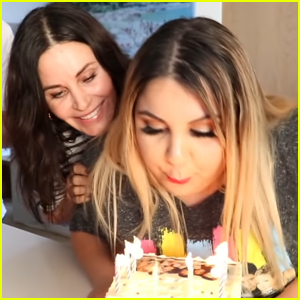 The 54-year-old Friends star teamed up with YouTuber David Dobrik to visit Suzy Antonyan on her 23rd birthday. In the video, David takes Suzy to a house in Malibu – which happens to be Courteney‘s house – to celebrate her birthday. Netflix Is Spending a Ton of Money to Keep 'Friends' on Streaming Service! Netflix is reportedly spending a ton of money to keep all seasons of Friends on the streaming service in 2019! If you don’t know, there was a scare this week where fans noticed that on the Friends Netflix page, it read that the show was expiring on 1/1/2019. Later, a Netflix exec said it was just a rumor. On Tuesday (December 4), the New York Times published a report stating that the streaming service was paying $100 million to keep the show on the platform! Apparently, Netflix previously paid $30 million a year to keep the show on the service.